We spend a lot of time talking about water and weapons around this site, but that doesn’t mean that we don’t love a good meal. When you’re making your long-term survival plan, you’ve got to think about where your next meal is going to be coming from…for the next…well forever. So picking out some meal options that are going to benefit you nutritionally as well as taste pretty good is going to be top priority. We all know that MRE’s (Meals Ready to Eat) are great sources of nutrients and typically only require you to utilize the included heating source to have yourself a 900 to 1200 calorie meal. 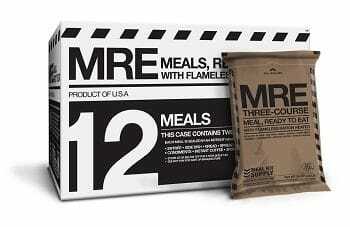 With a 5-year shelf life, you can stockpile MRE’s and have some reliable meal options that are pretty good. You can also supplement your survival cave with things like vacuum-sealed, foil-packed meats. Sweet Sue makes a pretty tasted chunk chicken that goes great in canned soups or pastas. There are also a wide variety of canned and pouched tunas that can be used to supplement meals. You can also stock up on novelty items like Yoders canned and fully cooked bacon. The added protein and flavors will be much appreciated in long-term survival situations. Don’t forget to look into stockpiling soups and pastas to go with your canned and pouched meats! Progresso and Campbell’s make a ton of varieties of soups that are all pretty healthy and high enough in calories to help you keep going day in and day out. You’ll also benefit from not having to add water to these meal options and that will put one less strain on your limited resources. Think of this as the last trip to the grocery store you may ever make. What are you going to want to have on the shelf in your long-term pantry? Get different types of soups. Get different flavors of tuna. Keep it organized and chocked full to ensure that you’re not just eating twigs and acorns a month into the apocalypse.